I look like my mom. I have my dad’s nose and his genetic code that forces us to eat every few hours or we feel faintish like the damsels in distress in old black and white movies. 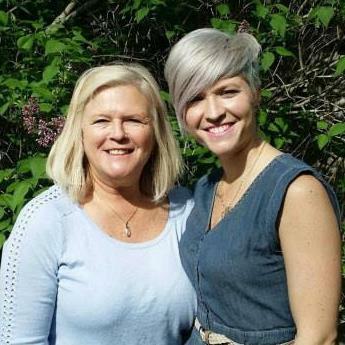 But when I walk by a mirror and catch my reflection I’m always taken aback by how closely I resemble my mom. I have this image of her and me in a van we rented for a family vacation when I was around 6. This was a time before seat belts so I was sitting on her lap, facing her in the back seat. I was undoubtedly telling her a captivating story when I put my tongue between my teeth and made that fake fart sound that is all the rage with that age group. My mom belly laughed hard. So I did it again and again until she was crying happy tears and gasping for air. I’m not sure if the vivid memory of her face while laughing is what she actually looked like at the time or some combination of what I look like now and how I remember her from my youth but either way-we look and sound eerily similar when we are belly laughing. 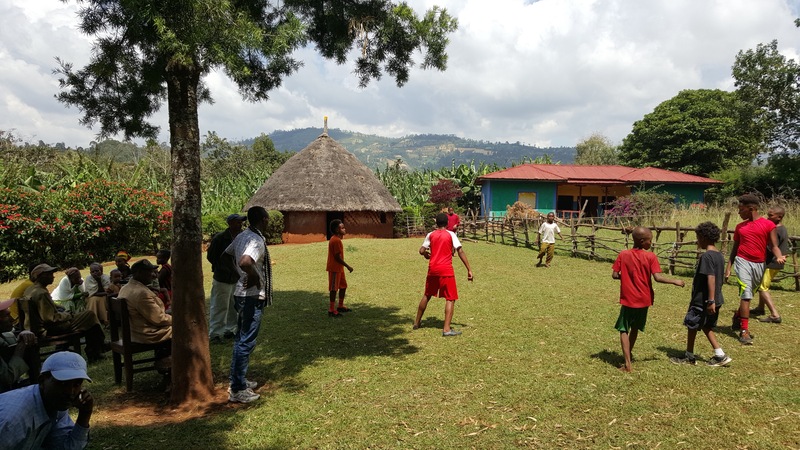 My most favorite thing about our trip to Ethiopia was that my boys finally got to do that too. Tariku’s special person stands exactly as he does in pictures. Exactly. When Tariku was playing soccer with his special people they played so similar. Nevermind that they’ve not played together for 7 years, all of their idiosyncrasies in the sport were the same. And their disappointment if they messed up? Identical. When Tariku’s special person put all of Tariku’s people on the same team there were always 5 identical reactions happening after any given play-either that of joy or frustration. Ethiopia is like every other developing nation in terms of the way dogs are treated. For the most part they are wild and often rabid, the closest they come to family pets is with regards to being a guard dog. Though even as guard dogs they are tied to a short leash and left in their cages, barking throughout the night. Not Tariku’s people though. They have an actual family dog that follows them around and helps them on the farm. When we went into the hut to enjoy lunch together the dog came too, lying at the feet of one of Tariku’s special people. 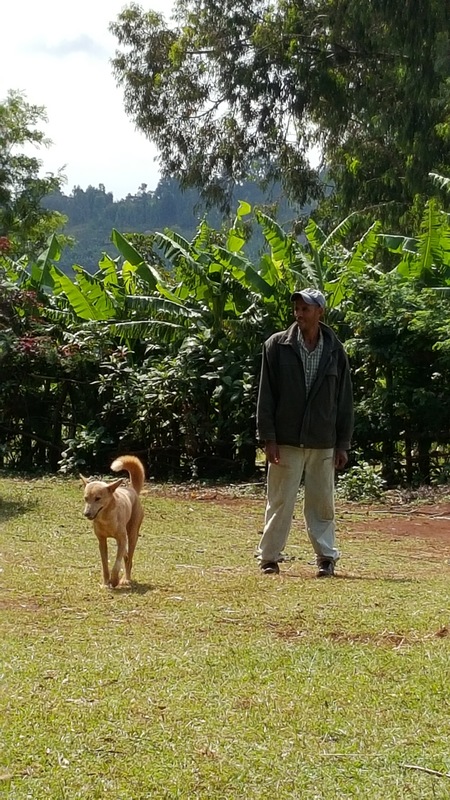 Of course the one family in all of Ethiopia with a pet dog belongs to Tariku. I say “of course” because Tariku has always loved animals far beyond the average child. Obviously Zach and I have an affinity for animals as well but Tariku came to us like that, he was never scared of dogs the way every other child adopted from Ethiopia often is. Tariku loved it when we pointed out that he clearly came from a long line of animal lovers. We were able to get a picture of Tomas and Binyam’s special person they lost. “Look at the furrowed brow Tomas! Oh my goodness it’s yours exactly!” Tomas beamed, “It really is, isn’t it mom?” Tomas met a special person who shares his big heart and tendency for happy tears when the occasion allows-when they first saw each other both broke down in undistinguishable happy tears. When a funny story was told of Tomas I was hit by a surround sound of identical laughs from him and 2 of his special people. It made the rest of us in the hut echo their laughs as well, happy tears springing from my eyes as well. Binyam looks just like one of his special people who always found her way next to him. This special person knew Binyam was shy and liked to keep to himself so she never pressured affection but she would often try to catch his eye and together they would smile-an exact mirror of one another. Binyam was obsessed with the chicks at the farm and spent the entirety of our time with his special people holding at least one chick. That’s funny, one of Binyam’s people said, another special person shows a tenderness to the chicks when he’s feeling anxious too. When Binyam’s special person was saying the Kembatissa word for “anxious” her miming looked just like Binyam’s-right down to the way her eyes became twice their normal size and her mouth-pulled tightly at the sides-almost looked like she was smiling. We had a chance to ask their special people about the ones they have lost. What were they like? Do you see any of them in our boys? The expression on my boys’s faces at their responses always reminded me of Harry Potter’s whenever someone told Harry about looking just like his dad with his mother’s eyes. It’s been said many times over on here how big of a fan I am of the Potter series, I think I became an even bigger fan after we adopted Tariku. 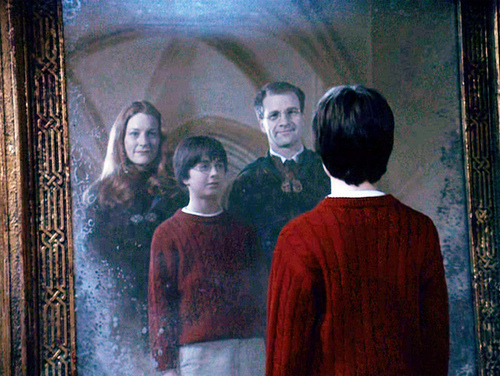 There’s a scene in the first book where Harry Potter finds the mirror of Erised, a mirror that shows the user his or her heart’s deepest desire. For Harry it’s his parents standing behind him looking content and pleased. 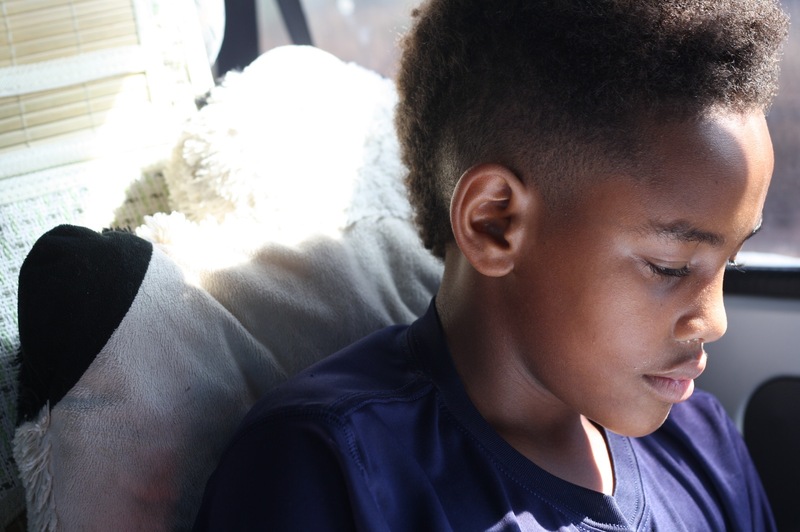 Of all the things for an 11-year-old to choose and he chooses to see his parents, this is a pretty big lessen for adoptive parents if we allow it to be. In many ways the genetic code can feel a bit like a tether, reminding us of who we come from and where we are when it feels like we’re on our own floating into the nothingness. A visible marker that proves we matter to someone. But it can also be a burden, particularly for kids who have suffered trauma or loss at the hands of those carrying their genetic code. I don’t want to oversimplify the experience our boys had while connecting to their like DNA coded kin because the truth is now that my kids know from whom they received the look of their eyes or the furrow in their brow it can be a reminder at moments that are not the most ideal to process adoption related emotional issues. For kids who are 11 or 10 or 9 being reminded when you look in the mirror of the person who caused you the most amount of pain-no matter how worthy or right the reasoning-is a really hard thing to work through. And sometimes due to the lack of maturity in their physical ages and the stunting that takes place developmentally when trauma is introduced into the equation-the manifestations of the shared genetic code are disrespectful, rude or hurtful. 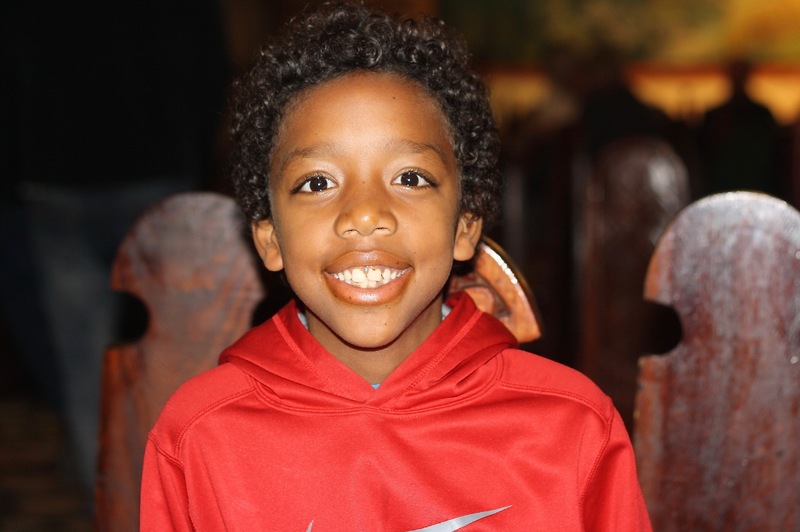 When those manifestations happen it’s hard to remember that they aren’t actually hiding their pain from us as adoptive parents but are indeed showing it to us in a way that speaks to their age. Though I don’t share any DNA with my boys, when they are in pain I feel it just as viscerally as if I did share their DNA and so am called to remember to respond in a loving way-no matter how annoyed or angered I am. This isn’t always easy but sometimes it’s a little less complicated for the precise reason that they look differently than I do. This difference in our physical appearance triggers the reminder of the pain so when I’m at my best, which I regret to admit is not always the case, I’m reminded of the trauma and can engage in a nurturing way. He shook his head yes and turned towards the mirror as did I, both of us smiling. Our own Mirror of Erised infusing love and support into our splintering hearts. Together we left the magical moment and went about our day, still feeling the power of our special people behind us. The burden and the blessing. Today I’m grateful for them both. 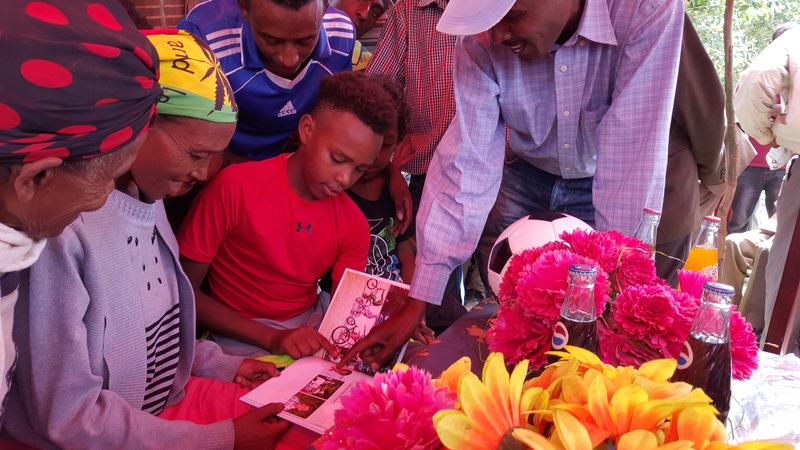 This entry was posted in Adoption, Attachment, Binyam, Ethiopia, Family, Family Trip to Ethiopia, Harry Potter, Motherhood, Parenting, Tariku, Tomas, Uncategorized and tagged Adoption, attachment, Binyam, Ethiopia, Family Trip to Ethiopia, Harry Potter, motherhood, Tariku, Tomas. Bookmark the permalink. This feels so important, all of it.